I was mostly bored by school, did little more than get by. Some things I did well, like talking and writing, but I shied away from anything that seemed ah, organized like math and the sciences. I liked to make stuff (still do). So…off to art school! One problem, I couldn’t draw very well. 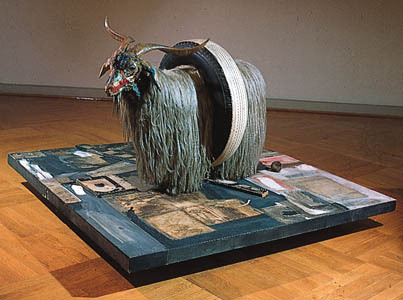 However, I wanted to make things, and two early encounters started me on my way: abstract expressionism and a goat. And, wow! There I was, a kid from Akron, Ohio, who couldn’t draw very well and liked to make things. Instant validation! After I left school, I started a furniture making and repair business that has supported me in one way or another for about fifty years. Recently I created a piece of sculpture that I look on as a reaction to the furniture repair aspect of my life so far. Okay, plant stand then, or fern stand, (a spindly, often fragile easily tipped over piece of furniture designed, to display a plant). Designed to fall over, I say. I’ve repaired a number of these over the years. They arrive in the shop each with a tale of woe: broken, water stained, missing tiny ornamental bits and some of them so narrow and spindly as to fall over if you look at them. Mind you, the iron stands are much more robust especially when firmly bolted to the floor (amazing the insights one gains from living with eight cats and a dog). Forthwith I present my contribution to this wretched tradition, the Standplant, containing both elements, stand and plant. Assembled as a fiendish complexity of random twists and turns so as to sorely try the patience of anyone unfortunate enough to ever try and repair it. I look forward to being cursed through the ages (assuming the cockroaches don’t win). Please visit my partner Susan Owen and me in our Cayucos studio during the 2012 Open Studios Tour, sponsored by the ARTS Obispo, San Luis Obispo County Arts Council. We will be open both weekends of October 13 & 14 and October 20 & 21.